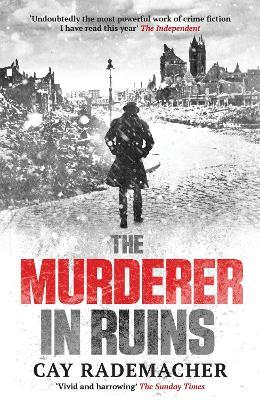 The Murderer in Ruins is the first of a trilogy, set in Hamburg, 1947. A murderer is on the loose and policeman Frank Stave, whilst plagued with worry about his missing son, is under increasing pressure to find out why - after the atrocities of World War II - someone still has th... read full description below. Hamburg, 1947. A ruined city occupied by the British who bombed it, experiencing the coldest winter in living memory. Food and supplies are rationed; refugees and the homeless are crammed into concrete bunkers and ramshackle huts; trade on the black market is rife. A killer is on the loose, and all attempts to find him or her have failed. Plagued with worry about his missing son, Frank Stave is a career policeman with a tragedy in his past that is driving his determination to find the killer. With frustration and anger mounting in an already tense city, Stave is under increasing pressure to find out why - in the wake of a wave of atrocity, the grim Nazi past and the bleak attempts by his German countrymen to recreate a country from the apocalypse - someone still has the stomach for murder. The first of a trilogy, The Murderer in Ruins vividly describes a poignant moment in British-German history, with a riveting plot that culminates in a shocking denouement.